Monthly data for October released in the last week was excellent. In stark contrast to ECRI's continued recession call, the Index of Leading Indicators was up 0.9, primarily as a result of the surge in housing permits, which rose to their highest level (ex-housing credit) in 3 years. Starts also remained steady at over 600,000. PPI fell -0.3% and the CPI fell -0.1%. The YoY CPI also fell -0.2% to 3.6%, the first YoY evidence from the recent decline in gasoline prices. 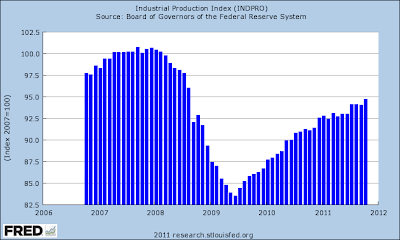 Industrial production rose by a strong 0.7. Real sales also rose strongly, up 0.5%, and with the decline in inflation, real retail sales were up 0.6%. The Empire State and Philly manufacturing reports for November were also both positive. The high frequency weekly indicators generally were positive again, but with a likely error in a housing report, and a disconcerting decline in tax withholding. 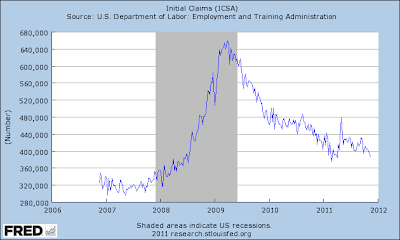 Starting with jobs, the BLS reported that Initial jobless claims fell 2,000 to 388,000. Only 3 weeks in the last 3 years have been lower. 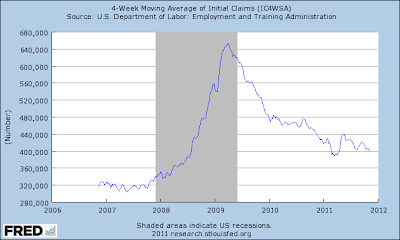 The four week average declined to 396,750. The four week average remains close to its best reading in over 3 years. 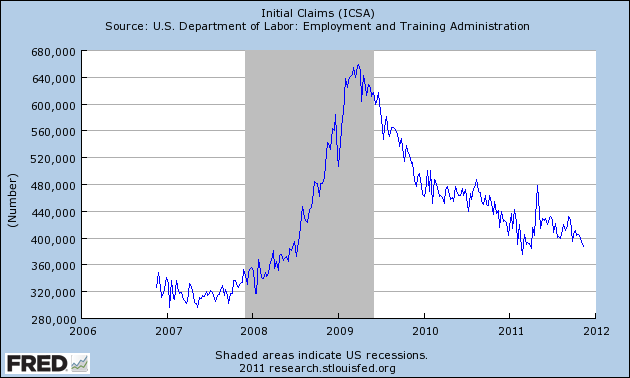 This is a short leading indicator and bodes well for the next payrolls report. The American Staffing Association Index remained at 91 last week. In the last couple of months, this series has resumed a slight upward trajectory, but remains lower YoY. Disconcertingly, however, Tax withholding was significantly down from last year's levels. Adjusting +1.07% due to the 2011 tax compromise, the Daily Treasury Statement showed that for the first 12 reporting days of November, $84.2 B was collected vs. $91.5 a year ago, a decline of -7.3 B. More importantly, for the last 20 days, $129.1 B was collected vs. $132.7 a year ago, a decline of $3.6 B or 2.7%. I use the 20 day metric precisely because there is a definite pattern to deposits by day of the week, but this is the steepest 4 week loss all year. This will have to be closely watched in the next several weeks. The MBA weekly report may have had errors. The Mortgage Bankers' Association reported that seasonally adjusted purchase mortgage applications decreased -14.8% last week. On a YoY basis, purchase applications were down -9.5%. This would be very bad, but it is completely at odds with the report of the same data at Mortgage News Daily, which showed a -2.2% decline w/w and a -5.1% decline YoY, which is firmly within the range that purchase mortgage applications have been in since May 2010. I am inclined to believe that Mortgage News Daily was reporting the correct numbers. Refinancing fell -12.2% w/w. Refinancing has been very volatile and affected by small changes in interest rates. Meanwhile, YoY weekly median asking house prices from 54 metropolitan areas at Housing Tracker showed that the asking prices declined -0.5% YoY. Once again, this is a new "best" YoY reading in 4 1/2 years. The areas with YoY% increases in price remained at 19, meaning that one third of all metropolitan areas in this survey now have YoY positive changes in asking prices. The areas with double-digit YoY% declines decreased to only 1 -- Chicago. Retail same store sales remained positive as they have been all year. The ICSC reported that same store sales for the week of November 5 increased 3.1% YoY, and 0.3% week over week. Shoppertrak reported that YoY sales rose 3.6% YoY and were up 6.5% week over week. The American Association of Railroads reported that total carloads increased 2.6% YoY, up about 13,700 carloads YoY to 544,600. Intermodal traffic (a proxy for imports and exports) was up 11,100 carloads, or 5.2% YoY. The remaining baseline plus cyclical traffic increased 1500 carloads or 0.5% YoY. Total rail traffic has rebounded in the last 6 weeks month after having been soft during the summer. Weekly BAA commercial bond rates rose .01% to 5.12%. Contrarily, yields on 10 year treasury bonds fell .02% to 2.05%. This is a very minor episode of increasing spreads in contrary directions. If it were to continue and amplify, it would represent significant weakness. Money supply continues to stabilize after its Euro crisis induced tsunami. M1 increased 0.1% last week, and is down -1.1% month over month. remains up 19.3% YoY, so Real M1 remains up 15.7%. M2 increased 0.5% w/w. It remained up 0.1% m/m, and 9.8% YoY, so Real M2 was up 6.2%. The YoY increase in both M1 and M2 remains very high. 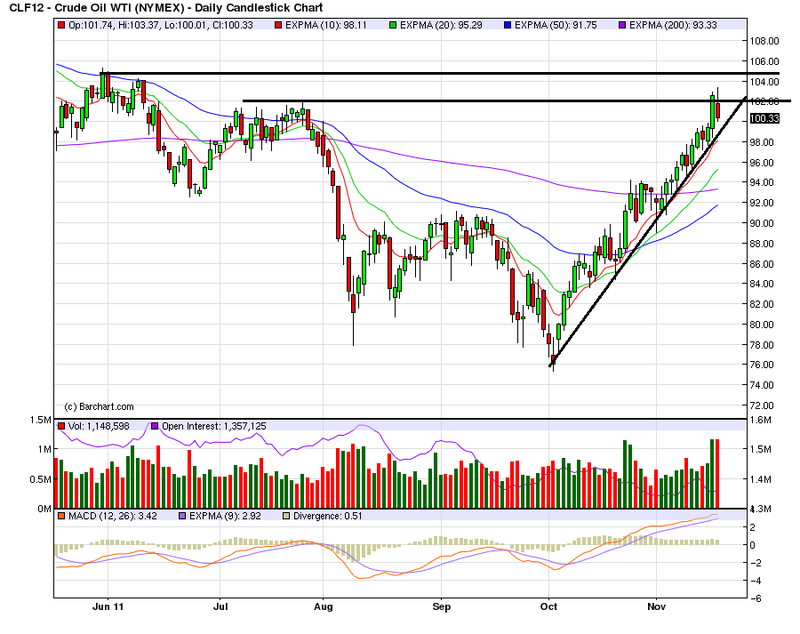 Finally, the Oil choke collar remains engaged, as Oil closed at $97.41 a barrel on Friday. 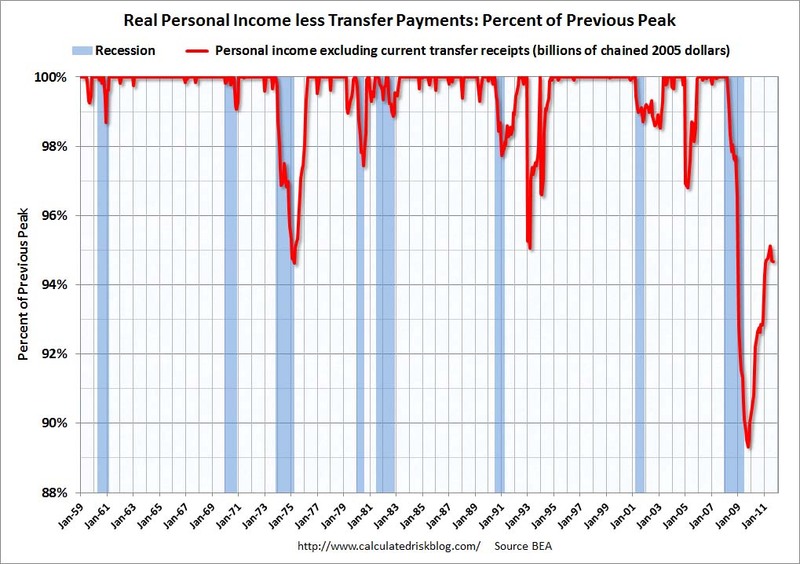 This is back above the recession-trigger level calculated by analyst Steve Kopits. Gas at the pump iincrreased $.02 to $3.44 a gallon. 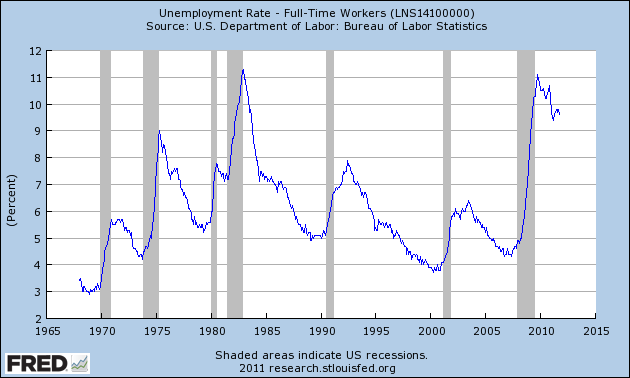 Measured this way, we probably are about $.15 above the 2008 recession trigger level. Gasoline usage is once again off substantially, down -3.7% YoY, at 8625 M gallons vs. 8952 M a year ago. The 4 week moving average is off -5.7%. This appears more and more to be evidence that consumers have permanently altered their gasoline usage habits towards more conservation. The stark difference in forecasts between the Conference Board LEI and the ECRI index sets up a real world test of these two reports. Most significantly, as far as we know ECRI does not make use of the yield curve, but the yield curve is an important component of the LEI. All of the monthly data reported this week shows an economy briskly expanding and poised to continue. The weekly data was more tepid, but generally positive with the very significant exceptions of the price of Oil and tax withholding. Since WTI and Brent Oil are converging, and retail gasoline prices so far are not reflecting any surge, this may not be as bad news as it initially seemed. The next few weeks will tell if the poor tax withholding in the last 4 weeks was noise or not. Psssst: is this the beginning of the end of the housing bust? Housing construction is a long leading indicator, indeed along with interest rates probably the most important one. So those commentators who say that we won't get housing improvement until we have job improvement have causation exactly backwards. Rather, it is much more likely that we won't get more meaningful job improvement until we have more meaningful housing improvement. Further, the decline in housing starts and permits after the expiration of the $8000 housing credit was probably an important factor in the slowdown in GDP earlier this year, and probably plays a role in ECRI's recession call. With October's report we are 70% of the way there from the March 2009 bottom of 513,000. It is worth keeping in mind that Bill McBride a/k/a Calculated Risk has shown the strong leading relationship between housing starts and the unemployment rate, so a confirmed uptrend should mean at least a small reduction in the unemployment rate. As Bonddad described earlier this morning, in the past week we have had a raft of very good economic reports. 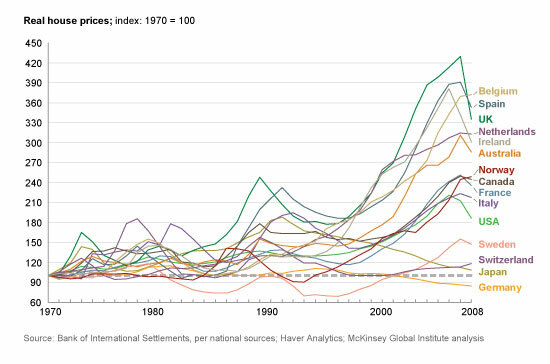 Housing permits was probably the most significant of them all. While by no means are we at the end of the housing bust (although the bottom was probably put in two years ago in terms of permits and starts), Wednesday's number was significant. If the trend continues, we may have 200,000+ improvement off the bottom within 6 to 12 months. In short, we may be at least at the beginning of the end. 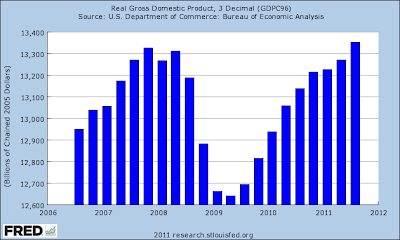 Real GDP continues to increase, and in fact is now slightly above the peak of the previous expansion. 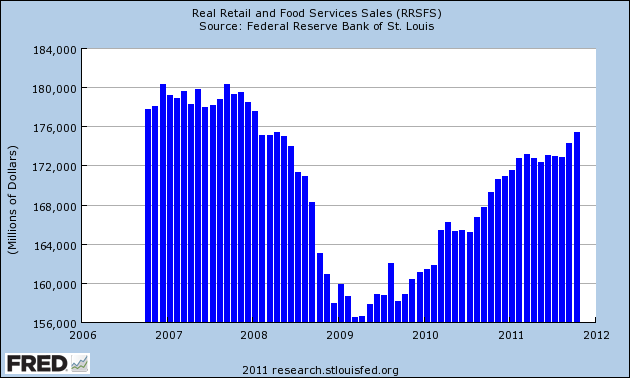 Real retail sales stalled for most of this year, but have increased for the last two months. 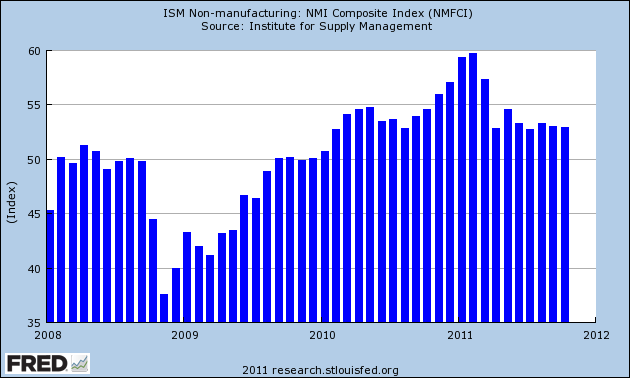 Industrial production is still moving upwards, although at a slightly reduced rate. 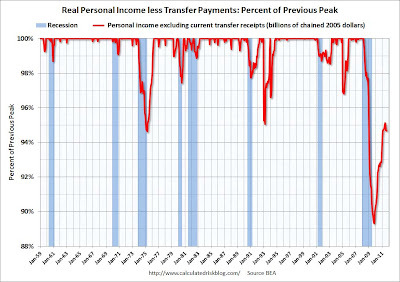 Personal income less transfer payments are still increasing, but are far below the previous peak. 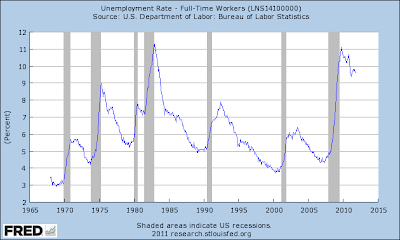 As usual, the one big problem area is employment, or perhaps, more appropriately, the lack thereof. 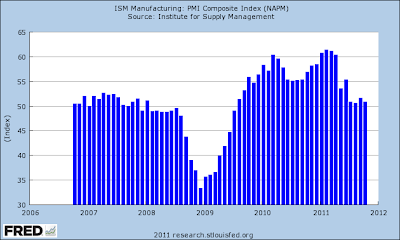 The ISM manufacturing index declined sharply earlier this year, but is still ever-so-slightly positive. The ISM services index is showing a reading above positive. 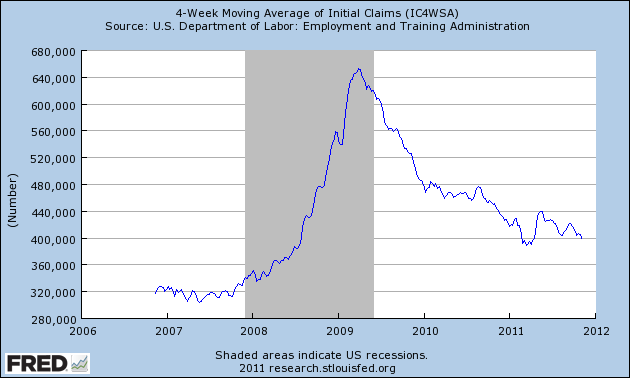 Weekly initial claims are now slightly below 400,000. Bottom line: the indicators say we're in for more fits and starts growth. Back in September of 2008, the credit markets began to seize when news that Lehman Brothers had lost access to its credit lines and thereby would be forced to close shop made the headlines. The normal operation of the capital markets depends on the availability and circulation of credit. Banks frequently require short-term funds to cover obligations for overnight up to a few months when there is not enough cash on hand to cover liabilities or they are unable to liquidate positions to raise the necessary capital. Normally, it isn’t difficult to raise this capital through the open market at very low cost; but when there is a risk of falling short of mandated reserves, banks will generally hold cash rather than lend it out. For those that come up short, such a situation can spell a quick end. These are the financial dynamics that we need to watch for now. We are already seeing the signs of real trouble building up. The most pressing concerns are still across the Atlantic as European banks are attempting to cut their holdings in Euro Zone government debt to shore up their balance sheets and meet reserve ratios that have been pushed up to 9 percent by regulators and have to be met by the middle of next year. Yet, we are seeing the strain spread to the US and the rest of the world. Gauging the global strain, the demand from European banks for funds in the US (struggling to find it in the EU), the Fed reported today that its swap lines to the region rose to $2.25 billion. Domestically, the Libor-Overnight Index Spread (a favored gauge for the cost of short-term money) rose to its highest since June of 2009. The kindling has been stacked. If there is a spark - like an influential bank failing (perhaps on the same level as MF Global) – credit markets could freeze and leverage dollar liquidity. For the last few weeks, the market has been moving sideways. Yesterday, we saw a change in several of the major equity ETFs. On high volume, the SPYs printed a strong downward bar that moved through the 200 and 50 day EMA. We see the move in good detail on the 10 day, 5-minute chart. Prices moved through important support a little before lunch yesterday and remained there for the remainder of the trading session. In addition, we saw the QQQs move through the 50 day EMA, also printing a strong bar on decent volume. That makes two equity indexes that made significant downside moves yesterday. Ideally, to confirm this move lower, we'd like to see prices advance into the EMAs on declining volume and then sell off once they hit important resistance levels (like the EMA). In contrast, we have the IEFs' which advanced yesterday, but with not quite enough momentum to make it through important technical resistance -- yet. With the weaker CPI print this week, real yields actually increased overall, meaning we have move upside room in the Treasury markets. OWS: more trouble than change? If it wasn't for Jon Stewart, I wouldn't be able to deal with the 24 hour news cycle. What Does the Market's Low Volume Tell Us? To find out how worried we should be, I analyzed stock-exchange volume at the beginning of all bull markets since the early 1970s. I relied on the precise definition of a bull market that is employed by Ned Davis Research, the quantitative research firm, according to which there have been 10 bull markets since the mid 1970s. For each of these bull markets, I calculated a ratio of two numbers: The first is average daily NYSE trading volume over the first six weeks of that bull market, and the second is the average over the six weeks prior to the bull market’s beginning (that is, in the last six weeks of the preceding bear market). I chose these six-week windows because that is how much time has passed since the early October lows. Across all 10 past bull markets, this ratio’s average was 2.15 to 1. That means that trading volume was more than twice as high in the first six weeks of the average past bull market than in the six weeks of the preceding bear market. How does this compare to what we’re experiencing today? The ratio of average daily trading volume in the six weeks since the October low to the average in the six weeks prior to that was 1.87 to 1 — 13% lower than this ratio’s average and lower than the minimum this ratio has been at the beginning of any of the last 10 bull markets. Today I want to start with oil, as its rally is ongoing. Prices moved through the 102 price level, but have fallen back in a standard profit taking move. Notice the strength of this rally; all the EMAs are moving higher, prices are above the 200 day EMA and there have been periods of profit taking along the way. There is technical resistance at the 104 area, but aside from that, there is very little stopping the upward advance. This is important because at some point, this will translate into higher gases at the pump. For the last few weeks, equity prices have been in a sideways trading pattern. However, yesterday we may have seen a break. The SPYs printed strong downward bar that moved through the lower line of the consolidating triangle and the 200 day EMA. The only support we see is at the 50 day EMA. However, this occurred in very low volume, indicating a lack of urgency on the part of traders. 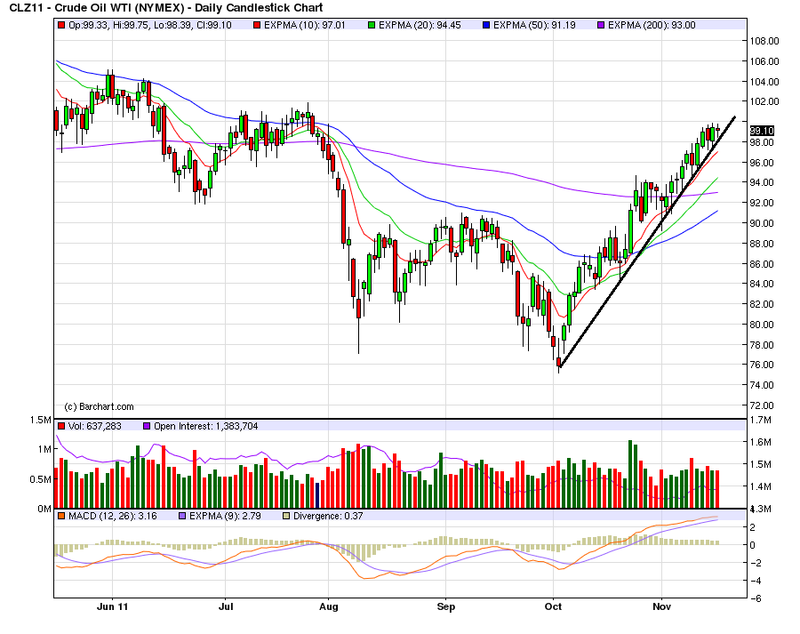 We see a similar move in the QQQs, with prices being a bit closer to the 50 day EMA. But we see that the Russell 2000s are still within their trading range. It's important to remember that the equity markets -- together -- comprise an entire data set. We need to look at all three major averages (SPY, QQQ and IWM) to get a clear understanding of the overall market direction. At the same time, we're not seeing a really strong rally in the Treasury market. The IEFs are still above all their EMAs, but we're not seeing any major new advances and volume is incredibly weak. Ideally, if we were going to see a massive stock market sell-off, it would be accompanied by a Treasury market rally as traders made a flight to safety. The dollar is still in an upward sloping channel, with prices just above the 200 day EMA. The shorter EMAs are in a tight bundle, indicating there is little direction in the market right now. Europe's debt troubles on Tuesday spilled over to top-rated nations that had been largely untouched by the crisis—including Austria, the Netherlands, Finland and France—in an ominous sign for European policy makers. Bond yields across the Continent jumped as prices dropped, in a sign of investors' faltering confidence in officials' ability to keep the debt crisis contained in the euro zone's troubled peripheral countries. Tuesday's selloff came amid news that the euro zone's economy scarcely grew in the third quarter. Trading of anything but German bunds—seen as safe securities akin to U.S. Treasurys—became difficult. Investors sold bonds issued by triple-A rated France and Austria. Even prices of bonds issued by fiscally upright Northern European triple-A nations such as Finland and the Netherlands fell. Among the cash-strapped periphery, Italian bonds again rose above 7% and Spanish yields surged to 6.358%, according to Tradeweb. The EU crisis is now spreading. This will do a few things -- none of which are good. 1.) It greatly increases the possibility of an EU recession in the next 12-18 months. This is a financial shock that will greatly hurt a financial system that doesn't need a shock of this magnitude at this time. 3.) The increases possibility this will be an economic drag on the US -- just as it appears we might actually be getting some economic escape velocity working. 4.) 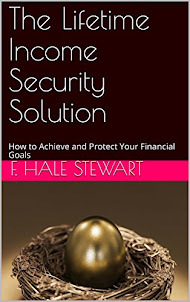 It increases the stress on the international financial system. In the latest senior loan survey, US banks reported increasing lending standards to banks with EU exposure. 3-month libor and has been climbing steadily since the beginning of August, indicating financial stress is increasing. In short, this is a bad development -- at a time when we really don't need this type of thing to happen. The sideways market continues. As a good example, the IWMs have been trading between 72.60 and 75.20, but have yet to break out in a meaningful way from their trading range. As such, we're still range bound. The treasury market is also moving sideways, consolidating recent gains caused by the flight to safety from the EU trade. However, this market is also waiting for a definitive reason to make a move in one direction or the other. Oil's rally is unbroken. Prices are consolidating a bit right here below the 100 price mark, but given the strength of the underlying EMA trend (a rising 10, 20 and 50 day EMA) it's difficult to see this market doing anything except move higher at this point. There are, however concerns on the fundamental side -- namely, that the EU's recession possibility is fairly high right now, which would lower demand. But as a possible counter-weight to that is China's managed slowdown which is going quite well right now. Copper is stumbling. After forming a double bottom in October, prices rallied through the shorter EMAs, but then moved lower in a downward sloping channel and are now tangled with the shorter EMAs -- which themselves are not giving us any firm direction. The MACD is no help either, as it is moving sideways. Riddle me this: did all of these countries have a Fannie/Freddie or CRA? Over the last few months, there's been a fair amount of discussion about whether or not the US was headed into a second recession. It started over the summer as manufacturing indexes dropped, mostly in reaction to to the EU situation, but also as a result of the slowdown caused by the Japanese earthquake. This was followed by a slowdown in service sector growth, continued poor readings in the housing and employment market, and a weak 2Q GDP reading that never really gained any upward momentum. Over the last month, ECRI announce a new recession was baked in the cake -- an announcement which I and NDD found not credible. However, lately the news has been slightly better. 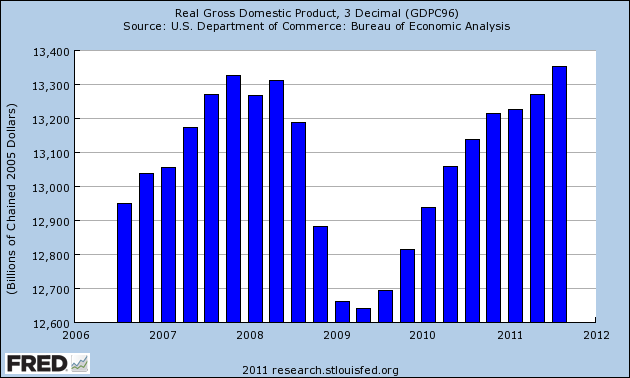 The biggest reason for this change is the initial 3Q reading on GDP, which came in at 2.5%. Making this a somewhat more optimistic number was the fact that had inventory adjustments simply been 0 in the report, GDP would have risen by 3.5%. In addition, employment, while not great, continues to print some job growth. And the latest few household employment surveys have been fairly encouraging -- which can also be said of the initial unemployment claims numbers. In short, the latest news has been fair, but not great, helping to tamp down the fear of a double dip. As we move forward, we're pretty much back to where we were at the beginning of the year -- fair growth that is unfortunately not strong enough to encourage massive hiring on the part of employers. More importantly, we still have the same storm clouds on the horizon -- an EU situation that is dicey at best, rising oil prices, and a Federal government that makes the Manson family look functional. Growth from a monetary expansion led liquidity drive is not going to happen as loan demand is incredibly weak. This more or less effectively neuters the Fed. And with Washington run by children (scratch that; childish behavior would be an improvement), we can't expect any meaningful help from our elected officials. So, we're back to GDP growth in the 0-2% range with a nibbling at lowering unemployment, but no real hope for a significant drop. As I mentioned yesterday, both the equity and bond markets are consolidating. Yesterday's action did nothing to change that development. For the SPYs, support and resistance are still at 122 and 129, and for the IWMs those numbers are still 72 and 77. Those numbers are 103.6 and 104.8 for the IEFs. Oil is still in a nice rally. Prices are continuing their multi-month advance, with the shorter EMAs all rising and the 10 and 20 now about the 200 day EMA. Also note the MACD is very bullish. This is a very deliberate, well-constructed rally, with advances and declines to allow for profit taking. Upside target right now is in the 102 area, but there is plenty of room over that number. About the only good thing is we're through the summer driving season. The good news last week was initial unemployment claims dropped to 390,000. The bad news is the 4-week moving average is still stuck around the 400,000 level. Rural roads have a traffic fatality rate that is more than three times higher than that for all other roads. In 2009, non-Interstate rural roads had a traffic fatality rate of 2.31 deaths for every 100 million vehicle miles of travel, compared with a fatality rate on all other roads of 0.76 deaths for an equal number of miles. Crashes on the nation’s rural, non-Interstate routes resulted in 17,075 fatalities in 2009, accounting for 51% of the nation’s 33,808 traffic deaths in 2009. In 2008, 12% of the nation’s major rural roads were rated in poor condition and another 43% were rated in fair condition. Vermont has the highest percentage of roads rated poor, at 43%, followed by Oklahoma at 30%; Kansas, 28%; Missouri, 20%; California, 18%; South Dakota, 17%; and Illinois, 16%. In 2010, 13% of the nation’s rural bridges were rated as structurally deficient and 10% were rated as functionally obsolete. A bridge is structurally deficient if there is significant deterioration of the bridge deck, supports or other major components. Structurally deficient bridges are often posted for lower weight or closed to traffic, restricting or redirecting large vehicles, including commercial trucks, school buses and emergency vehicles. Another AEP coal plant in nearby Conesville required more than 1,000 temporary workers to build a scrubber for one of its units. The plant then added 40 full-time employees to monitor the scrubber, which doubled the footprint of the unit. The device requires so much machinery it has its own control room. Ralph Izzo, chief executive of the New Jersey utility PSE&G, said installing scrubbers at two of his company’s coal plants created 1,600 jobs for two years, plus 24 permanent ones. A decade ago, in a landmark study, Morgenstern and others looked at the effect of regulations on four heavily polluting industries — pulp and paper mills, plastic manufacturers, petroleum refiners, and iron and steel mills — between 1979 and 1991. The researchers concluded that higher spending to comply with environment rules does not cause “a significant change” in industry employment. When jobs were lost, they were often made up elsewhere in the same industry. For every $1 million companies spent, as many as 11 / 2 net jobs were added to the economy. 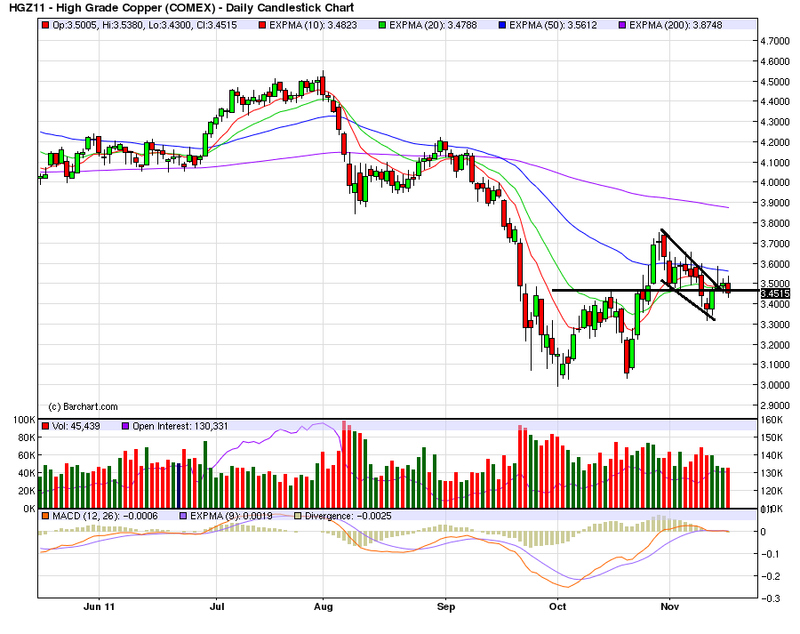 Both the Russell 2000 and the SPYs are consolidating in a triangle pattern at/near/around the 200 day EMA. All the shorter EMAs are moving higher. Also note the 200 day EMA is now moving sideways rather than down. For the IWMs, we have resistance and support at the 77 and 71 area respectively; with the SPYs, the numbers are 129 and 122. The QQQs have a rising bottom, but there are two possible tops. Either way, we still have prices consolidating. The shorter EMAs (10 and 20) are moving sideways) but the longer EMAs are moving higher. The equity markets are waiting for some type of confirmation -- one way or the other -- about the macro economic situation. The news over the last few months has been very contradictory in nature, hence the trading range. Like the equity markets, the treasury markets are also consolidating, waiting for something the happen. However, here we have prices consolidating above the shorter EMAs after a "safety bounce;" the treasury market caught a bid after Greece announced they would put the austerity measures to a public vote. Since the EU situation has calmed down a bit (again), prices have moved sideways. For both charts, I'd place support at the 50 day EMA.